Babai the Great (ܒܐܒܐܝ ܡܚܡܘܕܐ ca. 551 – 628) was an early church father of the Church of the East. He set several of the foundational pillars of the Church, revived the monastic movement, and formulated its Christology in a systematic way. He served as a monastic visitor and coadjutor with Mar Aba as unofficial heads of the Nestorian Church after Catholicos Gregory until to 628 AD, leaving a legacy of strong discipline and deep religious Orthodoxy. He is revered in the modern Assyrian Church of the East. Babai the Great, not to be confused with Mar Babai I, the first autonomous leader of the Church of the East, was born in Beth Ainata in Beth Zabdai. on the west bank of the Tigris, near Nisibis. Born to a family of humble means, he received a primary education in the Persian (Pahlavi) books. He continued his studies at the Christian School of Nisibis under the directorship of Abraham of Beth Rabban. Sometime around 571 A.D., when the Origenist Henana of Adiabene became the new headmaster, Babai's teacher, Abraham the Great of Kashkar, founded a new monastery on Mt. Izla above Nisibis. Babai taught for a while at the Xenodocheio of Nisibis. After that he joined the newly founded monastery of Abraham on Mt. Izla. When Abraham died in 588, Babai left and founded a new monastery and school in his home country Beth Zabdai. In 604 Babai became the third abbot of Abraham's monastery on Mt. Izla. Abraham the Great had started a monastic reform movement which Babai and other disciples carried through. Since Bar Sauma and the Synod of Beth Lapat, monks and nuns had been encouraged to marry. When Babai returned to Mt. Izla in 604, he expelled monks that lived with women on the fringes of the monastery, and enforced strict discipline, emphasizing a deep life of prayer and solitude. The result was a mass exodus, not only of the married monks. But the Church of the East was with Babai. In 604, the Catholicos Mar Sabrisho I died and a new Catholicos had to be elected. The choice fell between two men named Gregory: Bishop Gregory of Nisibis and Professor Gregory of Seleucia. King Khosrau II, the Sassanid emperor, stated only that his preferred candidate was Gregory, possibly meaning the bishop. The king's influential wife Shirin, however, disliked Gregory of Nisibis and preferred Gregory of Seleucia, who had once been her steward. The Synod (council) rejected the king's initial candidate, taking advantage of the ambiguity of name, and chose Gregory of Seleucia, who became Mar Gregorius I. The king was accordingly displeased, and reluctantly supported the elected candidate (after applying a hefty fine to him), and said, "Patriarch he is and patriarch he shall be – but never again do I allow another election." When the Catholicos Gregorius died a few years later in 608, the bishops made the usual request to the king to allow them to elect a new Catholicos, but Khosrau had not forgotten the events of the previous election and refused them leave to do so. The royal physician Gabriel of Shiggar, a staunch Miaphysite, suggested to make Henana of Adiabene or one of his students Catholicos, and also used his influence with the king to prevent an election. From 610 to 628 the last and most devastating wars between Byzantium and Persia took place. First Persia conquered parts of Byzantium, which were populated mostly by Monophysite and Chalcedonian Christians. To be popular in the newly gained provinces, King Khosrau II did not want to favor the Nestorians any more. During the successful Byzantine counterattack 622—628, Chalcedonians and especially Monophysites were on the advance in Persia and several sees and villages were lost by the Church of the East. The king successfully blocked an election in the church, preventing the church from having any figure who could allow new bishops and metropolitans to be consecrated. During the decades of this vacancy, the Nestorian church required a sort of authority. Because the king remained staunch in his policy, the church chose to separate itself from the king's royal proscription. Two vekils (regents) were selected as a stop-gap measure: Archdeacon Mar Aba, who handled matters in the north. In the south, Babai the Great was chosen to lead, who at the time was abbot of a monastery on Mt. Izla. He was nominated inspector-general or visitor of the monasteries of the three northern provinces by the Metropolitans of Nisibis, B. Garmai, and Adiabene. Therefore Babai, even though not yet a bishop, acted as patriarch in all ecclesiastical matters, though he could not ordain or consecrate. He was appointed 'visitor of the monasteries' of the north, and administered the church in collaboration with Archdeacon Mar Aba. In particular, this new position allowed Babai to investigate the orthodoxy of the monasteries and monks of northern Mesopotamia, and to enforce discipline throughout the monasteries of northern Mesopotamia, even against occasional resistance. Babai the Great and Mar Aba administered the Nestorian Church for 17 years. Attempts were made during that time to ask the king to change his mind and allow an election, but influences in the court, such as Gabriel of Shiggar, and the king's wife Shirin (who was under Gabriel's influence) blocked the requests. Gabriel was seeking to maneuver things such that the decision of Catholicos would have been in his own (monophysite) hands, an option completely unacceptable to the bishops. The king defended this policy until his death in 628. The situation, and vacancy, endured until Khosrau II was murdered in 628. After this, Babai was promptly, and unanimously, elected Catholicos, but he declined. Soon afterward, he died in the cell of his monastery on Mt. Izla, being 75 or 77 years old. Besides bringing discipline to the monasteries and administering the church, Babai is mainly known for his orthodox teaching. To defend and clarify the Nestorian tradition against Henana's Origenism and the advancing Monophysites, Babai the Great produced some 83 or 84 volumes of writing. He developed a systematic Christology, the only one in Nestorian Mesopotamia. Of his extensive exegetical works on all of Scripture nothing survived. What remains are two hagiographies, his principal work on the foundations of ascetic life 'On the Life of Excellency', and commentaries on mystical themes. From what has been preserved it appears that his main authority was Theodore of Mopsuestia, though in general he used few citations from the Fathers. There is no evidence that he could read Greek, and Babai must have relied on translations. He mainly fought against the ideas of the Monophysites and of the Origenist Henana. They were the inner enemies. He also wrote against Mani, Marcion, Bar Daisan, the Messalians and the general loss of discipline since Beth Lapat. The Book of Union is Babai's most systematic surviving christological treatise, divided into seven memre that cover more than 200 folios. The 'Tractatus Vaticanus' is another manuscript that deals with the "impossibility of the hypostatic union and natural union, the possibility of the parsopic union, and the significance of the expression hypostatic union among the fathers of the antiquity". An important source on the position of Babai the Great against Origen and his follower Henana of Adiabene is his commentary on Evagrius Ponticus. It also shows his opposition to Messalianism. An 8th-century manuscript has been preserved that contains Evagrius' text together with Babai's commentary on it. This commentary is an abridged version of a larger one which Babai had written earlier and which is lost. The writings of Evagrius were important to the current mystical revival among Greek and Syrian monks. For the monks of Mt. Izla, Evagrius was the pillar of mystical theology. The Greek text was condemned already in 553 for its Origenist heresies. But unlike the Greek, the 'Common Syriac Version', a translation of the Gnostic chapters of Evagrius by the Monophysite Philoxenus, was void of the specific Origenist-Evagrian Christology. For example, it omits the 'nous-Christos' Christology where the God-logos and the flesh are united in the nous, Jesus Christ, the subject of incarnation. Babai tried to eliminate the Origenist ideas even further and presented Evagrius as opposed to Origen and his follower Henana by pointing out apparent contradictions between them. "The Devil is telling the people that some of Evagrius' statements are similar to heresies. Some even tried to translate directly from the Greek to show the heresy of Evagrius. They translated according to their foolishness, but can be refuted by other writings of Evagrius. The cursed Origen and his disciple, the fool Apollinaris, they teach completely different from Evagrius on the renewal of the soul after death". To show this further, Babai tells the vita of Evagrius and enumerates his sources: Basilius, Gregorius, and Nectarius. No mention of Origen. 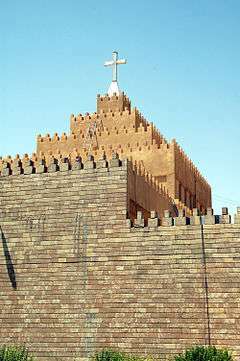 The Holy Apostolic Catholic Assyrian Church of the East. The normative Christology of the Assyrian church was written by Babai the Great (551–628) and is clearly distinct from the accusations directed toward Nestorius. And most important, instead of breaking with Theodore because of some extreme interpretations of his teachings, like others did, Babai clarified his position to the point that differences with western Christology became superficial and mostly an issue of terminology. His Christology is far less dualistic than the one Nestorius seems to have presented. Babai in the 'Book of Union' teaches two qnome (hypostasis—not the Chalcedonian use of this term, essence), which are unmingled but everlastingly united in one parsopa (person, character, identity, also "hypostasis" in Chalcedonian usage.) It is essential to use the Syrian terms here and not any translations, because the same words mean different things to different people, and the words must be accepted in the particular sense of each. In Greek Christology, hypostasis is used specifically to refer to what would correspond to Babai's parsopa, and ousion would correspond to qnome. In the period in which Babai and others formulated their respective Christological models, words such as "hypostasis" and "ousion" had less specifically fixed definitions. Thus, it was possible for two individuals to honestly use a single term to mean two distinctly different things. According to Jaroslav Pelikan, "Syriac was a richer and more complex language than either Greek or Arabic, and it allowed for more precise distinction". To Babai, Christ is both God and man. But he could not tolerate any form of Theopaschism (the belief that God suffered), be it the divinity itself, the Trinity, or one of the hypostases of the Trinity. According to Babai, Cyril of Alexandria stood at the root of simple Theopaschism as professed by the Monophysites, and the Emperor Justinian I at the root of composite Theopaschism. The Nestorian church could accept expressions like 'Christ died', 'the Son died', but not 'the Word died', even not 'the Word died in the flesh'. In one person of one Sonship. Likewise the Sonship of the Son is in two natures, one person. So the Holy Church has taught. Babai Magnus, Liber de Unione, Corpus Scriptorum Christianorum Orientalium, tomi 79/80, syri 34/35, Louvain 1915. (The first figures correspond to the Syriac edition, the second to a Latin translation). Wigram, W. A. (1910). An introduction to the history of the Assyrian Church, or, The Church of the Sassanid Persian Empire, 100–640 A.D. Gorgias Press. ISBN 1-59333-103-7.